Heat oven to 400°. Spread tortillas with margarine; cut into fourths. Place on ungreased cookie sheet. Bake 4 to 5 minutes or until golden brown. 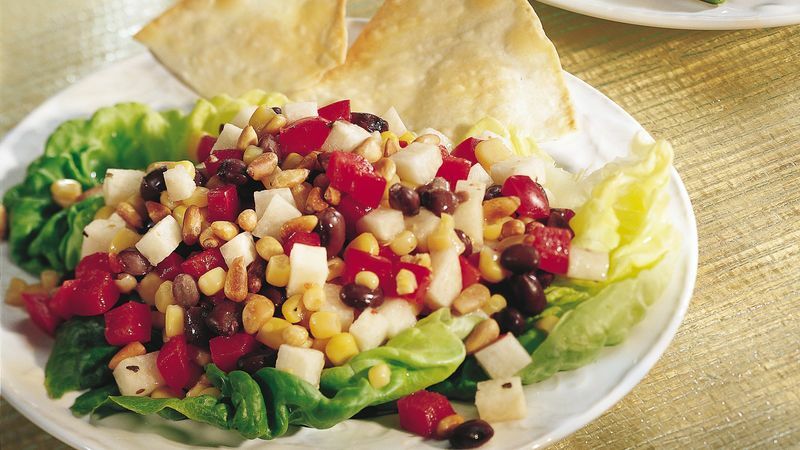 Toss remaining ingredients except lettuce and nuts until mixture is coated with dressing. Serve salad on leaf lettuce; sprinkle with nuts. Serve with tortilla wedges. If you're eliminating all animal products from your diet, be certain to check tortilla labels; some tortillas may contain lard, which is animal fat. Whole wheat tortillas also make tasty wedges to serve with this salad. Diagonally slice 4 grilled boneless, skinless chicken breast halves. Arrange chicken on salad in step 3. Continue as directed.